Chocolate has always sort of been my weakness. I mean, sweets in general are- but when chocolate is added to that equation, my heart just sings! I swear I say to my husband at least once a day, "MmMm I could really go for a nice big slice of room temperature chocolate cake with chocolate frosting right now..." Not even kidding. Wish I was. Has to be room temperature too! Everything just sort of melts together in your mouth so much nicer when it's room temp. ALTHOUGH during my birthday weekend we were so "caked out" (I didn't even know that was possible!) that we ended up placing a slice of CHOCOLATE CAKE WITH CHOCOLATE FROSTING in the freezer for later consumption. Needing little cake fixes throughout the remaining weekend, we ate it totally frozen. That dang thing, straight out of the freezer was so good! It was firm but not rock solid...and surprisingly amazing. Who knew? Room temp still wins my heart though. You learn things everyday. I'm all about learning how to eat cake better and faster. Knowwhatimean? This dessert however is best served cold. I mean I guess it would be 'aight out of the fridge...but it's meant to be cold...which is great because that means "me eating now now!" faster. MmMmmM. What the heck is Pot De Creme? Well! Let me tell you! There are basically three types of custard desserts out there. You've probably heard of and eaten them! With Creme Brûlée (which means, "burnt cream") your custard is made solely with heavy cream and egg yolks. With Pot De Creme (which means "pot of cream"), a mix of heavy cream and whole milk as well as egg yolks and eggs are used. Finally, with Flan (or Creme Caramel) your custard would be consisting of whole milk and whole eggs. Get it? Richest --> Lightest. Traditionally Pot De Creme is served in a small pot with a little lid on top. Buuuuuuut I doubt anyone has one of those lying around, so ramekins work just as nicely. Place ceramic ramekins in a glass baking dish (or any other high lipped baking dish). **Note** If using paper ramekins like I chose to do, wrap bottom of each ramekin in tin foil and allow tin foil to go up sides. This will protect against the water bath it will be sitting in. Set aside. Make a double boiler (small pot of simmering water with metal or glass bowl on top), and gently melt the chocolate within that double boiler. Once melted, set aside. In a separate bowl, whisk together egg, egg yolks, and vanilla sugar until fully combined. Whisk in the melted chocolate into the egg mixture- making sure to scrape down sides to fully incorporate chocolate into the mix. Set aside. In a small non-reactive sauce pot gently heat your milk and cream. You'll want to heat it over medium to medium-low and until JUST about to simmer. This is called "scalding". Once your milk/cream has scalded, remove from heat and SLOWLY add A LITTLE AT A TIME to your chocolate/egg mix, whisking the whole time to prevent cooked eggs. This is called "tempering". Continue to slowly pour until all liquid has been added to chocolate mix. Scrape down sides and whisk again. Now, carefully pour your custard mix through a fine mesh strainer or "chinois" into a large measuring cup (this is for easy pouring), or into another bowl. Finally, pour strained custard into your ceramic or paper ramekins (which are in your baking dish) and carefully pour HOT water into your pan until it reaches half way up your ramekins. Bake at 325*F until starting to set- will jiggle a little tiny bit in the very center still. About 30 minutes, but check- your oven may change baking time. Remove from oven and remove ramekins from water bath. Allow to cool. It will continue to finish firming up in the center while it cools (and continues to cook). Doing it this way will prevent your custard from over baking! Cool 10 minutes room temperature and then place in fridge to cool completely. While chilling, make your sweetened whipped cream! In a mixer bowl (or by hand) beat your cold cream until frothy. Add your powdered sugar and continue to whip together until medium peaks form! Viola! When ready to serve, place ramekin on a doily on a plate and top with a heaping spoonful of whipped cream! 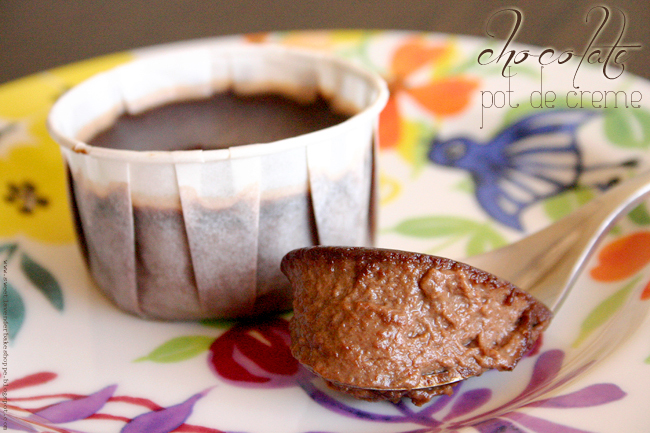 **Can make pot de creme the night before and keep in fridge, covered, until next day. **Can make whipped cream a few hours before and keep in fridge, covered until ready to use.